Broadgates in Anderby, near Mablethorpe sleeps 12 people. 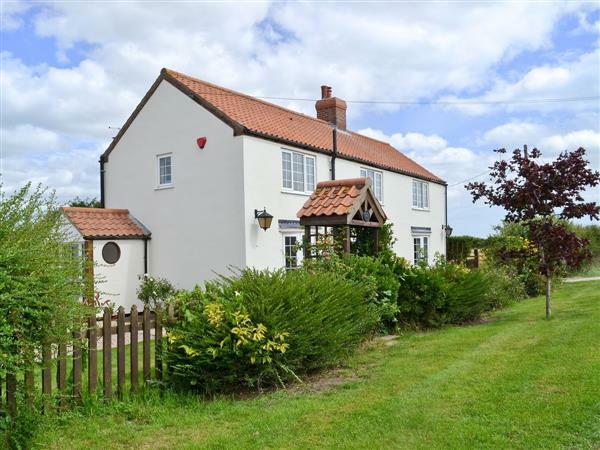 Broadgates near Mablethorpe is only ¾ mile from a beautiful sandy beach; Broadgates is a detached farmhouse which provides great family-sized accommodation, being very comfortably furnished and benefitting from two ground floor bedrooms. Whether it’s a family holiday or a peaceful break, Broadgates is ideal for both. With no near neighbours and extensive gardens and grounds, there is space for everyone, and a large hot tub to enjoy as well. Situated very close to Anderby Creek, perfect for both summer seaside holidays and relaxing winter escapes. A pub and shop are close by, and Anderby Creek boasts the UKs first cloud observation deck. Visitors can enjoy watching the seals at Donna Nook, and cycling, walking, golf and birdwatching are all popular pastimes locally. Contrasting pleasures of family fun at Skegness and the wildlife of the Gibraltar Point Nature Reserve are found 8 miles away, whilst historic Lincoln, with its soaring cathedral, cobbled streets, interesting shops and Christmas markets, is an easy drive as are the beautiful Wolds and their delightful market towns. Nearby is a café and bar with a coarse fishing lake only a ¼ mile away (at cost). Golfers will love the famous links course at Sandilands with North Shore and Seacroft golf courses in Skegness also only a short drive. Enjoy a drive around the Lincolnshire Wolds where the local towns have regular market days. Horncastle and Alford also enjoy a good selection of antiques and collectables shops. Butlins and Fantasy Island Theme Park are both only a short drive along the coast with the traditional seaside resorts of Skegness and Mablethorpe nearby too. Birdwatching is popular on the sand dunes and also at Gibraltor Point Nature Reserve, 8 miles away, which has an excellent visitor centre and café. The beach, shop and pub are all ¾ mile from Broadgates near Mablethorpe. Large living room with wood-burning stove and French doors. Sitting room with TV and wood-burning stove. Kitchen/dining area. Double bedroom with 5ft bed and TV. Twin bedroom with TV. Shower room with toilet. First floor: Two double bedrooms, each with 5ft bed and TV, one with en-suite shower room and toilet. Further double bedroom with TV and en-suite shower room with toilet. Twin bedroom with TV and en-suite shower room with toilet. Bathroom with separate shower cubicle and toilet. For a better idea of where Broadgates is, you can see Broadgates on the map below. Broadgates is in Lincolnshire; should you be on the lookout for a special offer, you can find all the special offers in Lincolnshire. It's always worth checking to see what is on offer at the moment. Do you want to holiday near Broadgates (RGGN), you can see other cottages within 25 miles of Broadgates; have a look to find your perfect holiday location.